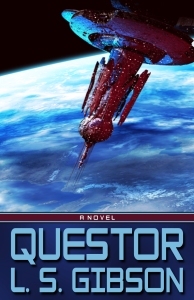 After spending three years in space, exploring their assigned quadrant but finding nothing, the Questor is finally returning home. Suddenly they find themselves in the middle of an unknown dangerous phenomenon which throws them wildly off-course, so far that it will now take twenty years at best to get home, not six months. They don’t have enough supplies and they also have damaged systems, so when they discover two inhabited worlds, they hope for assistance. Captain Sullivan puts the Questor in orbit around the first planet, so he can begin negotiations there, and meanwhile, Jon Hardaway and his best friend Manny take a two person shuttle to the other planet. Jon discovers that the second planet is heavily shielded, and he and Manny end up crashing onto the surface, barely surviving. It is then that they discover that any help they receive will come at a very high price. Unfortunately, the Rhiava run up against the Mideans, a power hungry race who thinks only in terms of weapons and wealth. I found this conflict to be very realistic, and while the setting for this novel is far away, the problems of using technology without harming the environment is one we face on a daily basis. Jon and Manny quickly decide to aid the Rhiava in any way they can. The plot takes many twists and turns, keeping the tension building until the end. And the ending is rather like the solution to a mystery novel in that all the clues are there, but I was totally taken by surprise. The dialogue is a bit stilted and the characters all talk in much the same voice, but the telepathic thoughts are very well done. There is a lot of diversity in the inhabitants of this world, and the descriptions of the planet are excellent. I really felt as if I were part of the story. Lovers of fantasy are sure to enjoy Questor. The exciting, fast-moving pace along with the wonderful characters make this a sure-fire hit.